The Togiak River is another very popular fly fishing destination in Alaska. People come to the various rivers from all over the world to catch the large Salmon that run these rivers each year. People also come here for river fishing for trout as well. The Fly fishing can be amazing during these runs, and the season is short so you need to plan your trip early while fly-fishing guides, charters and fishing lodges are still available. 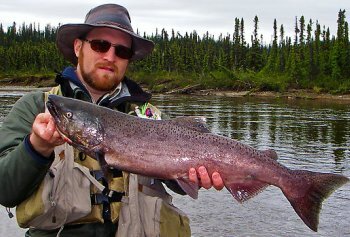 There are many Alaskan fly fishing guides, fishing charters, and fly fishing river lodges available to choose from. Salmon fly fishing a very popular sport in the state, and many people travel to the many salmon filled streams every year. If you have never fly fished for salmon you do not know what you are missing. Why not give it a try? The Togiak River, a tributary of Bristol Bay has one of the best Salmon runs in all of Alaska. Bristol Bay has more runs of Salmon than any other place in the world and the Togiak will see hundreds of thousands of Pacific Salmon. Some of the other fish that will spend time here are; Rainbow Trout, Dolly Varden, Char, and Northern Pike. This river is 70 miles from where it dumps into Bristol Bay. There are many tributaries that feed the Togiak that have great trout fishing where the water is crystal clear. The big runs of Kings start in June and these Salmon will vary between 25 and 40 pounds. The Silvers will be in numbers in August and September. Chum, Pinks and Sockeye arrive in June and are there in numbers through August. In addition to fly-fishing you can also spend your time spinning, casting, backtrolling or sight fishing. No matter your method this is some of the best sport fishing in the world. Leave the Togiak River, go to Alaska page to see other rivers.